Diamond Tiara and Silver Spoon on a stroll through Ponyville. Ever sense "The Last Cutie Mark Crusade" I've wanted a follow up episode on these two, even more than I wanted it for the CMC. 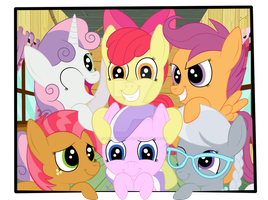 I wish we saw more of them on MLP now that they've reformed. I miss them. "You know what Silver?" the pink filly began. "Now that we stopped these the cutie marks, I feel that we have so much more free time for ourselves." "Yeah. And I feel a lot less bad ever since." the gray filly replied. "What do you mean?" the tiara wearer asked her. "Well, I always felt that we should stop before we turn into... bad ponies." the gray filly replied, with a grimace. "Huh? I never was a bad pony!" she irritably replied. Silver raised a eyebrow. "Well... I-I-I'm a better pony now." she added with a guilty face. "True." she replied, with a smile. Diamond slowly smiled back. "Okay. What should we do now? No school today, it's sunny for the day and Pinkie Pie is out of town, so it's going to be more peaceful today." "I think I'm going to visit the town hall and talk with Mayor Mare." the pink filly replied. "Huh? What for?" the gray filly asked back. "Well... I kinda like to give orders and..." she began, before Silver stared at her. "What? I thought to became a mayor like her." "And give orders to everypony?" "Well... yeah. But not for me. For everypony sake. My cutie mark says so." "Oh. That's a great idea! Maybe you could become the new mayor of Ponyville." "Baltimare? Vanhoover? Manehattan?" she continued. "No! Canterlot! I want to be the mayor of Canterlot!" she told her friend with a big smile on her face. "Canterlot? B-but don't the princesses rule over that city? I mean as Equestria rulers and mayor of the city?" "Yes. But I'm going to bring back the post of mayor out of the royals sisters and I will the first on them!" she replied back, beaming. "Wow!" Silver exclaimed. Diamond nodded proudly. "You are not a bad, but a mad one!" she added. The pink filly as shocked. "Ask our mayor first how to become one, first. I mean without your parents help, of course." "Hey! I know I can! And I will become Canterlot's mayor!" "Yeah, yeah I heard you." she replied back, indifferent. Which infuriated Diamond. "I'll see you later." she continued, walking in another way. "Hey! Where are you going?" the surprised filly asked her. "If you are going to polish your ordering skills, I'm going to polish the silverware my dad made this morning. And maybe he will teach me how to make them." she responded back. "See you later!" she added becoming continuing his stroll, Diamond looking in her direction. "We are going to eat lunch together, right?" the pink filly shouted at her. "Yeah! See you at Sugar Cube Corner!" the gray filly shouted back. The tiara wearer let out a relieved sigh and headed for the city hall, with a grin. "Okay Mayor Mare, I hope you won't be too busy to help. Because I need to know how to become the best mayor that Equestria ever had." Thank you. I kinda felt something about her being possible and the story came out. My pleasure. BTW, it is not a headcanon. Just an idea.